It happens EVERY week, doesn't it? We all have one of those days when we get to the fridge and we can't figure out what to eat. I'm a big fan of planning ahead, so what I try and do is keep a well-stocked pantry, and a fairly well-stocked fridge so that I can almost always put something together that is delicious, easy and nutritious. I have staple items that go into my shopping basket each week so that I have good "colors" around: organic red bell pepper, carrots, sweet potatoes, kale/chard/collards, romaine, a bunch of herbs - usually parsley or cilantro, and red onions and garlic. I also keep my pantry stocked with bulk items like quinoa, millet, brown rice (basmati, sweet brown, and a brown rice mix), wild rice, and amaranth, plus raw seeds and nuts: sunflower, pepita (pumpkin), sesame, walnuts, almonds and cashews. For canned goods, it's always helpful to have a few cans of beans on hand – garbanzo beans (chickpeas), black beans, and white beans. When it comes time to needing quick food, I know that I have the foundation for a healthful meal – good carbohydrates, healthful proteins, good fats, and loads of minerals and vitamins plus all the extras - think antioxident-rich phytonutrients. This recipe is one of my favorites. Chock full of vitamins, minerals, protein, folate and antioxidents, this easy recipe makes a great, quick weeknight meal and converts to a perfect, packable lunch. 1 cup quinoa (white, red or black - it doesn't matter) 2 cups vegetable stock or bouillon (veggie or chicken) 1 teaspoon cumin, ground or whole seed 1 tablespoon olive oil 1 small red onion, chopped 1 small organic red bell pepper, chopped 1/2 bunch kale, ribs removed and finely chopped 2 to 3 large garlic cloves, minced 2 cups cooked chickpeas or 1 14-oz. can, drained 1/3 cup freshly squeezed organic lemon juice 1 cup chopped fresh parsley salt and freshly ground pepper to taste. 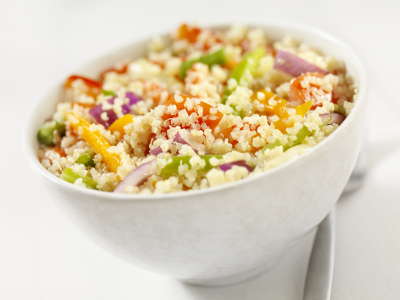 Rinse quinoa several times in a bowl of cold water. * Bring the water to a boil in a small saucepan and add the bouillon or stock and the quinoa. Lower the heat, cover the pan and simmer until the liquid is absorbed and the spiral of the quinoa germ is visible, about 15 minutes. Let stand for 5 minutes or until ready to serve. Heat a large heavy-bottomed skillet over medium heat. When it is hot, add the olive oil and then the onion, garlic, red pepper, and kale. Sauté, stirring, until the onion is translucent, about 3 to 5 minutes, and then add the cumin. Sauté for about 30 seconds, then stir in the quinoa and chickpeas. Stir together for a few minutes, then add the lemon juice and parsley. Combine well, add salt and pepper to taste, and remove from heat. Serve hot or at room temperature. Tastes great cold the next day. *Rinsing removes the saponin - a protective coating that naturally coats the grains of quinoa as it grows. If not rinsed, the saponin leaves a bitter or soapy taste on the grain.